Call at a supermarket satisfied. In this way your decisions won’t be dictated by hunger and you will be able to follow the shopping list rationally. 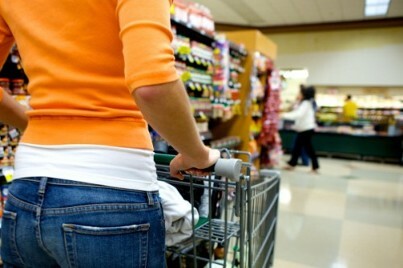 Supermarkets use flavoring, in order to earn on your hunger, and also offer various snacks and fast-food products. Leaving children at home or at a game room you will be able to concentrate on the purpose of your visit better. It is much easier to stay rational, when you are calm, when you are not urged on by anyone or when there is no one to grizzle. Besides you will avoid unintended, but desirable by a child, purchases. Try to make a decision on the brand names beyond advertising space. In this wise you will avoid different tricks that are concealed in goods’ arrangement on the shelves. Shelves that are located at eye level are the most attractive for selling, because a great deal of customers’ attention is turned to them automatically. Usually those goods, which should be sold first and foremost, are placed on these shelves (products with expiring pull-date, paid out placing, campaign products). Lower shelves are meant for sweets, so your child could see them and give no peace to you till you don’t buy them. Pay attention to the whole commercial range of goods and make a conscious choice. Signs “Sale” or “Discount” are general methods of attracting customers’ attention. In this case primary attention goes off and a customer, like a child, takes a notice of bright (usually red) captions. What is the reason for a reduced price? – In fact there is no sale. Supermarkets often indicate old price and a new one, with discount. However, in most cases, “old” price is imaginary or overestimated, so a customer felt an appreciable difference between these two numbers. – Initiation of demand. For example, buying shower gel you get bath sponge as a gift. But, of course, price of the “gift” have been already included in total cost. Calculate the sum that you will pay at the cashdesk, while shopping. Play on price tags is another trap of supermarkets. Small print, indication of several prices (with/without discount), shifted placing of price tags under goods – all these tricks are meant to make you ignore the cost. In contrast to supermarkets, we appreciate our money and tend to save it. Remembering the total cost of goods in the shopping cart you will immune to the temptation of buying unnecessary products. Allocate small sums on spontaneous purchases. In any case it is hard to leave a supermarket without buying anything unplanned. As spontaneous purchases we can buy a new product or brand that has caught our attention or various sundries offered at the cashdesk. Selling at the cashdesk is the last chance to get some more money from a customer. With this particular purpose supermarkets restrict the number of operating cashdesks to create a line. And of course a bored customer will catch up one more “necessary” thing ultimately. Planning your budget you should take into account the possibility of impulse purchases and, as a result, overrun of paid amount at the cashdesk. In this way you will avoid unpleasant emotional experience. We wish you enjoyable shopping!